I don’t really know what to tell you about these bars other than it is chocolatey, peanut buttery deliciousness. 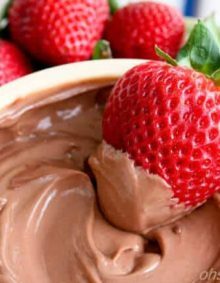 Oh, and don’t forget that crumbly topping….The 4th of July isn’t all about the red, white, and blue berry desserts, it’s also about chocolate. We have quite a few favorites like, Biscoff Oreo Banana Bread, Peanut Butter Meltaways (peanut butter cookies stuffed with silky chocolate-oh yeah baby)and out favorite Texas Chocolate Sheet Cake. 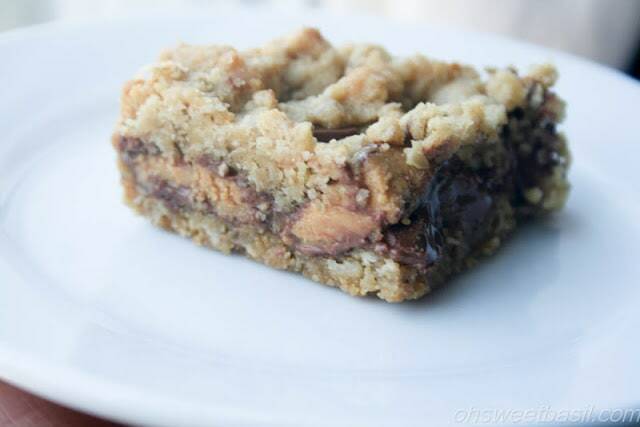 Reese’s Crumble bars have been a huge hit around here. 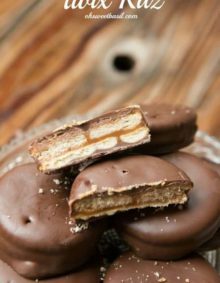 In fact, they’ve been such a big hit that I’ve already been asked by the husband to make them again and he generally isn’t a candy fan so it’s kind of a big deal that he liked them. I’ll be honest, I’m actually not a big candy fan anymore either, but I do really enjoy peanut butter and chocolate together. This was a fun little recipe to do with my kids too. It was easy enough that I didn’t worry about anything going wrong, and it involved candy which made the girls super excited. 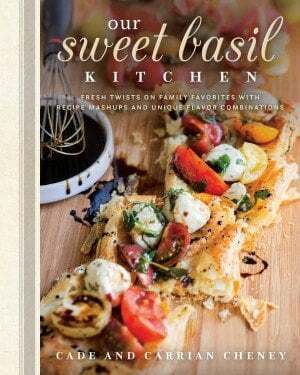 Lately I’ve been looking for more ways to entertain and teach the kids at the same time and cooking is still one of my favorite ways to do that. 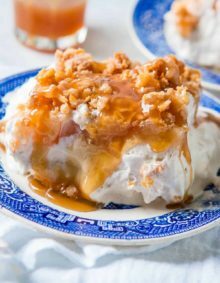 If we are making something like this dish I try to talk about why we bake it a little before adding the filling, why we don’t eat treats like this very often etc. The kitchen is the perfect place to bond as a family and to talk about important things like math, science, and nutrition. Love it. Are Reese’s Peanut Butter Cups Gluten Free? Reese’s Peanut Butter Cups are free of gluten. 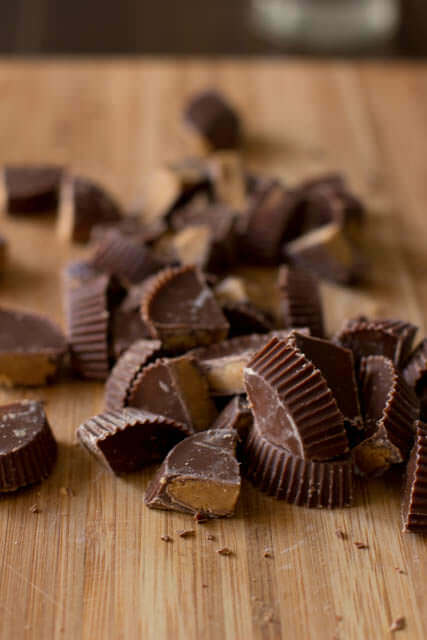 All varieties of Reese’s Peanut Butter Cups, except seasonal specialty varieties, are gluten-free. Can You Use Salted Butter Instead of Unsalted Butter in Recipes? If your recipe calls for unsalted butter, but you only have salted butter, you can use salted butter in place of unsalted. You can leave out the added salt in the recipe to assure that it isn’t too salty. How Long Will Homemade Cookies Stay Fresh? Homemade cookies can be kept for 2-3 weeks. To keep crisp cookies fresh, store in a loosely covered container. Moist cookies should be stored in a container with a tight lid or in an airtight plastic bag. Preheat the oven to 350 degrees with the rack in the middle position. Grease an 8×8″ baking dish. In a medium mixing bowl combine the butter, sugars, salt, flour, oats and baking soda. Mix well until all ingredients are combined and slightly moistened. Press half of the crumb mixture into the baking dish. Bake for 8-10 minutes or until the crumb mixture is beginning to get browned. Remove from the oven and sprinkle with the chocolate chips and then the Reese’s Peanut Butter Cups. Sprinkle with the remaining crumb mixture and place back in the oven for another 15-18 minutes. Remove from the oven and allow to cool before slicing in order for the bars to hold together. Thank you Jennifer! Chocolate and peanut butter are the best!! What temp do you bake this at? 350 degrees…step 1 of the instructions! Enjoy! 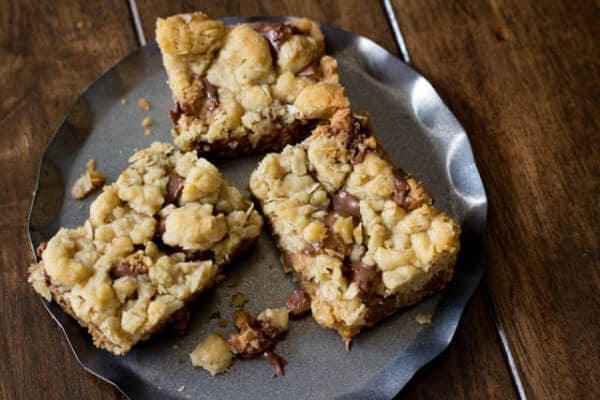 Hi, how do I make the crumb part to sprinkle over? I want take these into lactation bars. So I would be adding brewers yeast and flax seed . Would I need to change anything to the recipe ? I was just researching lacation cookies so I could get ready for baby in a few months! I honestly have never tried it so I’m unfortunately not sure, but I’d love to hear any advice you end up having so I can do the same. I ended up using the recipe below. I took out the cinnamon. 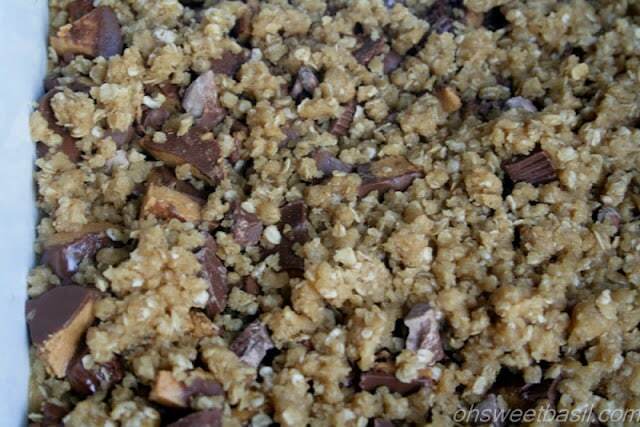 I added 3 tbp of brewers yeast and 1/4 cup flax seed meal and chopped up reeses cups and semi chocolate chips. They turned out so chewy and yummy you can’t even taste the Brewers yeast . I might would use all unsalted butter but that would be my only change . 2. Into your stand mixer or large mixing bowl place 2 C flour, 1 tsp baking soda, 1 tsp baking powder, 1 tsp salt and 1/2 tsp cinnamon. Toss them together with a fork to combine. 3. Grab 2 1/2 cups Old Fashioned Oats and add them to the mixing bowl. 4. Add 1 1/2 C brown sugar and toss everything together to mix. 5. Melt 1 1/4 C butter and pour it into the bowl. Mix for one minute. 6. Add 2 eggs and 1 Tb vanilla. 7. Mix until the dough has combined. It will be crumbly. 8. Add 2 1/2 C chocolate chips. I used milk chocolate, but semi sweet, butterscotch or cinnamon chips would also be fabulous. Mix the chips in. 9. Spray a 9×13 pan with cooking spray and press the dough into it. 10. Bake for 20 minutes. Stick a butter knife or toothpick into the center. When it comes out clean the bars are done. Don’t worry if they look a little bit underdone. They should. 🙂 This will help them stay nice and moist. 11. 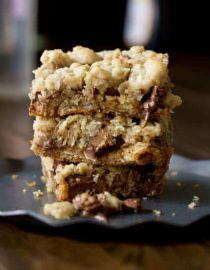 Allow them to cool completely and then cut into bars, or eat them warm from the pan…whatever suits your fancy. You are amazing!!! Thank you so, so much! Hopefully this time around will be better for me with keeping my supply up! 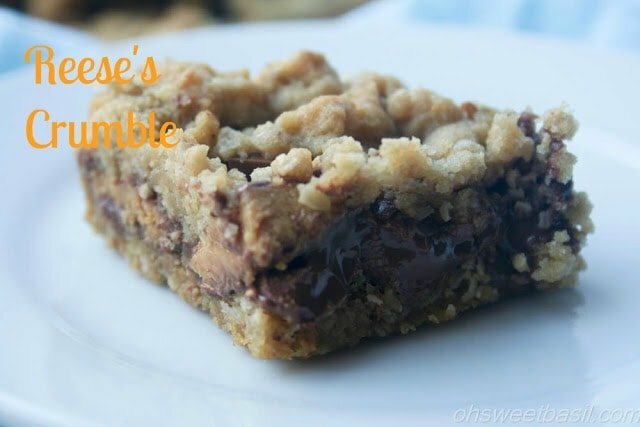 We love Reese’s Crumble! Made them twice in one week! Easy to make. Yummy & sweet tasting. But,very rich. This recipe was a hit! ❤️ Thank you for sharing the recipe. Yay! That makes my day! Thank you so much for your answer! I made them yesterday with chocolate, peanut butter and crumbled snickers-bars. My parents came to visit, and they loved it. Next time i will try them with different sorts of chocolate. Dang!! Now I want to make them that way! Hmmm….I think you meant 3/4 STICK of butter, not 3/4 CUP of butter. When I put 3/4 cup of butter in, the mixture ended up like a soupy cake batter, not crumbly. Pressing on, though….I just doubled the recipe and I’m making it in a 9×13″ pan….I’ll let you know how it turns out. Hey Bev, shoot I don’t know what happened. We’ve been making these for a long time and I haven’t had that occur yet, but maybe I had mom brain and I really do use 3/4 stick. I’ll make the recipe again next week and update if necessary. Thanks so much for the heads up!! Do I use a 3/4 stick of butter or do I use what is called or in the recipe. Is there a way to make them without Reese’s? We don’t have them here in germany, and to order them is really expensive. Maybe i could use crunchy peanut butter and dark chocoalte instead? 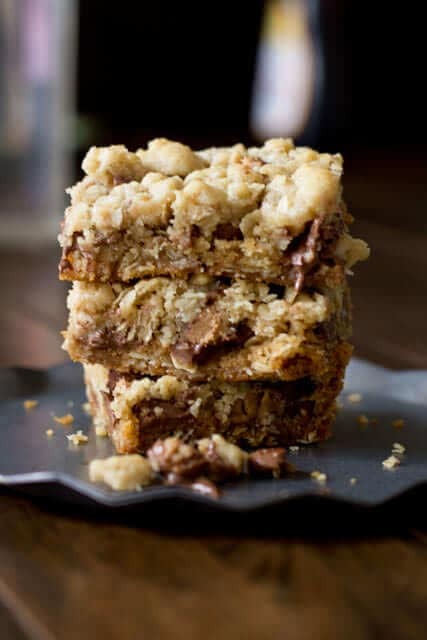 If you take creamy peanut butter, some confectioner’s sugar, melted butter and graham crack crumbs, mix them together, press in a pan, melt chocolate chips and spread over the top, let set and then cut it…it’s pretty much like having reese’s peanut butter cups. You can eat it like that, or chop it up to put in a recipe like this one. Do you have peanut butter chips in Germany? If so, you can use the chips and chocolate chips as well. That might work too! Just made these…amazing!! The chocolate/peanut butter combination is great. Definitely making these again. I pinned this. 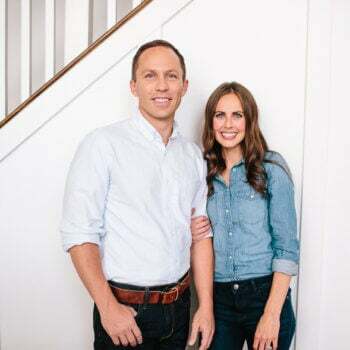 They look awesome! I'm glad this recipe is for an 8×8 pan instead of a 9×13, where I feel guilty about eating all the leftovers (but do it anyway.) Looks delicious!